He fully accepted the paradox implied in the conclusion that his movements had direction but no aim. 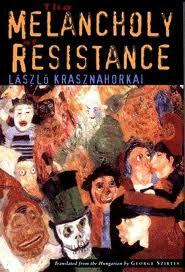 It’s been on my shelf for years, but I have only now gotten around to reading László Krasznahorkai’s novel The Melancholy of Resistance. I’ve actually written about the book before in a post on the various novels for which W.G. Sebald wrote blurbs. But this summer James Wood wrote an essay on Krasznahorkai for The New Yorker, which prompted me to get The Melancholy and plunge in. Even though a sense of impending chaos and evil hangs over every page, The Melancholy of Resistance is intensely, almost indescribably comic. The plot might be simple, but Krasznahorkai’s style isn’t. Krasznahorkai writes with a maniacal intensity and originality of the bawdy and language-lush novels of the 17th and 18th centuries. His often long sentences operate like a multi-faceted lens that refracts the world into multiple vantage points almost simultaneously. The Melancholy is a digressive ramble, the narrative point of view being handed off from befuddled character to the next like a baton. Here are some extracts from a nearly six-page description of Mrs. Eszter sleeping, while three rats rummage through her room. She was a sound sleeper, so after a few minutes she quietly nodded off, and the occasional jerking of her feet, the rolling of her eyeballs under their thin lids and the ever more regular rising and falling of the eiderdown were accurate indicators that she was no longer properly aware of the world about her, that she was drifting further and further from the present enjoyment of naked power which was rapidly diminishing but would be hers again tomorrow, and which in her hours of consciousness whispered that she was mistress of her cold poor possessions and that their fate depended on her….Her body – perhaps simply because it was no longer covered – seemed to grow even bigger than it already was, too big for the bed and indeed for the entire room: she was an enormous dinosaur in a tiny museum, so large no one knew how she had got there since both doors and windows were too small to admit her. She lay on the bed, legs spread wide, and her round belly – very much an elderly man’s beer-gut – rose and fell like a sluggish pump; her nightgown gathered itself about her waist, and since it was no longer capable of keeping her warm, her thick thighs and stomach broke out in goosepimples….The night, in any case, was slowly coming to an end, a hoarse cockerel was furiously crowing, an equally angry dog had begun to bark and thousands and thousands of sleepers, Mrs. Eszter among them, sensed the coming of dawn and entered the last dream. The three rats, together with their numerous confreres, were scuttling and squeaking in the neighbor’s rumbledown shed among frozen cobs of well-gnawed corn, when, like someone recoiling from a scene of horror, she gave a disconsolate snort, trembled, turned her head rapidly from left to right a few times, suddenly sat up in bed. The Melancholy was turned into a film that is usually described in polarizing terms (Roger Ebert, who liked the film, said audiences would either find it maddening or mesmerizing). 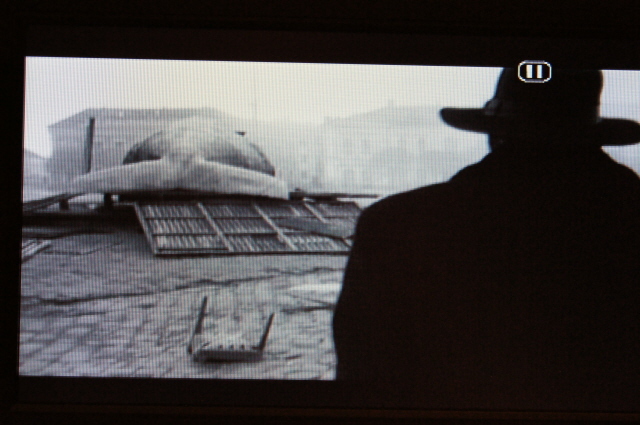 Béla Tarr’s 2000 film Werckmeister Harmonies translates Krasznahorkai’s novel into a stunning visual and aural experience, full of luminous and mysterious scenes. (The 145 minute film is infamous for being comprised of only 39 shots.) But in doing so, Tarr exchanges the pervasive sense of paranoia and dread for physical angst, and turned Krasznahorkai’s text to humorless and, at times, agonizingly slow scenes. I can’t do either the book or the film justice, except to recommend both. I also suggest watching Tarr’s 2007 film The Man from London, which has a strong cast that includes one of my favorites, Tilda Swinton. This is an adaptation by Tarr and Krasznahorkai of a Georges Simenon novel of the same title.